Compact, practical spray to easily obtain the desired water jet without wasting a drop. 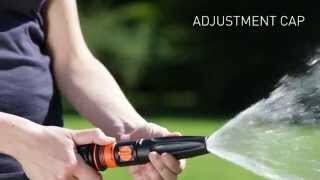 The comfortable handle allows you to regulate the flow rate at any moment to satisfy all your irrigation needs. Rotating the cap, you can regulate the spray from jet to fan spray. The cap is equipped with a specific system that prevents it from unscrewing completely to avoid losing it. New-design nozzle with adjustable jet: from closed to open (jet or fan spray). Water flow regulation by turning the knob valve. Pieces per pack: 15 pcs. Pieces per pallet: 1920 pcs. Pieces per pack: 5 pcs. Pieces per pallet: 360 pcs.